She didn’t allow herself more than a moment of enjoyment before pushing ahead, following the property barrier across the grassy countryside. Young shoots of green hay grew on the opposite side of the wall and throughout the majority of Ásta’s land. Enough food had to be stored for the livestock if they were to be expected to make it through the hard winter. Snæland, the land of snow, didn’t get its name from being a place of never-ending summer. When the far side of the hay field was finally in sight, Ásta’s eyes swept past it to the barley crop. Rows of shoulder-height green stalks lined the earth. Some had reached their full size, and their spiked heads were emerging. Everything appeared to be growing on schedule with no sign of disease or drought. Ásta continued to follow the wall past the barley and caught sight of Rolf and Bjorn. Her farmhands were walking the property border holding long wooden tools. As she drew closer to them, she noticed their strained expressions. Rolf’s broad shoulders and round cheeks reminded her of her father, but that’s where the comparison ended. Rolf often made jokes and told stories that never seemed to end, which drove Bjorn to the hills to work alone. “Looks to be.” Rolf folded his arms and stared at the long stretch of caved-in earthen wall. The winter had been hard on the man-made boundary. Some sections had eroded away. That was to be expected. But the newfound damage wasn’t. This wasn’t the first time this had occurred since her father and brother had fallen from the cliffs and died last summer. Her body shook as she glared at the wall, knowing exactly what the others likely thought of it. She’d heard the whispers behind her back over the last four years since she was sixteen and her puckered wounds were still healing. She wanted to be as confident as her father had been about her not being the focus of the frightful king of wolves. The son of the god Loki would have far more important things to do than to bother with a maiden, he’d assured her. The only problem was, she could still feel the heat from the beast’s breath on her face and its claws slashing at her flesh. Her pulse quickened, and fear made her veins run cold. All Ásta could do was nod, hoping he was right. She didn’t want them to see her panic. She was the head of household, and she needed to show strength. No one was stronger, she reminded herself. She would have to be tough if she didn’t want the memories of her mother, father and brother dishonored. Her grandparents had sailed to this faraway place for glory and had claimed this land. No one from the southern quarter made a better mead than she, using a recipe that had been passed down by the women in her family. Most could not afford the bees or honey, but the farm had always seemed to supply them with the silver they needed, until now. “It must be repaired,” she said, standing tall. He didn’t need to tell her. She already knew that wall repair often took more time than expected and was backbreaking work. Walls required many strong men to maintain them. Once the sheep were herded back to the farm at the end of summer, they would need to be contained on the property so they wouldn’t wander off to die. If she couldn’t follow the law and take care of her land, she would lose it to someone who could, and that wasn’t an option. Ásta rolled up the sleeves of her dress and stared at the toppled wall. If she had a husband to share the responsibility of such a demanding land, things would be only slightly easier, which was just as well, for she had already grown used to the idea that no man would have her. She was marked by the creature that according to legend would one day destroy the king of the gods, Odin. Bad luck had seemed to follow her as far back as she could remember. She turned around and started toward home. The sound of the men fell away the farther she went. All she could think about was making enough silver to hire more hands around the farm. The walls were her most immediate problem, but the issue was even larger than some toppled turf. She picked up the pace, hurrying back. The farm came into view. 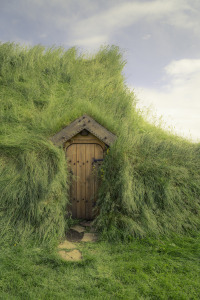 Various buildings, covered and built with sod, looked like growths on the grassy landscape. Ásta ran along the turf wall to the gated entrance of the farm. Across from her was a long building with a peaked grassy roof. She entered through its wood-framed doorway. The small room was barely lit, but it only took a moment for her eyes to adjust to the low light. She walked between two large wooden beams and into the main hall of the longhouse. “But will you have enough to keep him away at harvest? I do not like when he visits,” Elfa whispered. Her answer was swallowed up by the cool, dark room. Basins held cultured milk and skyr, a watery cheese, which filled her nose with a sour scent. Beef that had been cooked and preserved with whey hung from the rafters. Small barrels held ale for daily drinking, and in the far corner were the casks of mead that Ásta had made last fall with help from her large colony of bees. She counted the barrels. If she could sell them all, she would make enough silver to hire a few more men. As long as her bees produced honey over the summer, she would make more mead by the harvest so that she could repay her debt and the cost of the hives, as well as have enough left over to hold onto for next season. If her luck turned around, that is. Ásta walked through the longhouse, lost in thought. She hunched down to pass through the threshold and closed the door behind her. She ran past the animal shed, drying hut and water basin before slowing down. One of the milking cows called out as it was startled by her fast movement. Along the outer wall of the farm, wildflowers grew in the field beyond, tiny spots of color on the horizon. There, beside the stacked turf, nestled in some brush and protected from the wind, were a series of domed baskets. The skeps held her most prized possessions, the queen bees and their hives. The soft hum from the bees met her ears and she smiled at the sound of it. They were alive and happy buzzing around their homes for now. She walked across the yard to the smithy shed. Beside the cold stone hearth, she found the practice sword and picked it up. It was heavy in her hand, but its edges and tip were dull. If swung hard enough, it would leave a mark and a bruise. She squeezed the grip tight and clenched her jaw. Leaning up against the outside of the small building was a large woolen sack filled with dried grass. Ásta unfastened her cloak and let it fall to the ground. She held the tip of the sword in front of her and quickly skirted aside, whipping the blade sideways into the sack. She withdrew and thought of the enemy. Her pulse quickened as she pictured it. Pointed ears with a toothy grin, an enormous creature unlike anything she’d ever seen. Sagas from their homeland to the east spoke of such animals: wolves. But the creature that haunted her land was far larger than legend. Nearly as tall as her shoulders, with eyes so human they made her shiver. She swung again, feeling the muscles in her arm tighten from the effort. The thought of it lunging at her, viciously growling, was hard to shake off. If anyone knew she’d seen it since last harvest, walking the cliffs, its eyes fixed upon her, the stories would never fall silent. All would be certain that Fenrir, the king of the wolves, had come to claim her and would suspect that the god Odin had turned his back on their family. She would be labeled unlucky. She couldn’t let anyone know about the claw marks on her boundary walls. Too many tragedies had befallen her already. The animal attack had left her disfigured, her kin had crossed the Rainbow Bridge to enter Valhalla, leaving her alone and now her farm was crumbling around her. If she had any hope of turning things around, she would have to fight the Norns of Fate, the giantesses who controlled the destiny of man. Fight like her father had taught her. She could remember him putting that very practice sword in her hand after the claw marks on her face had sealed with scabs. He’d asked if she wanted to be claimed by any beast, to which her answer was no. Then you must be more ferocious than your enemy, he’d said. Ásta thrust the sword into the sack once more and roared. Her scream was carried off in the wind. She panted and leaned over with her hands to her knees, unable to shake her feeling of unease. Even though she had a plan, she worried it would unravel like everything always did. Forever unlucky. Wind bent the grass to the ground. The flat stone Torin had used to tunnel with was covered with dirt. He brushed out the hole he’d just dug and studied its dimensions. Its two-fists-wide cavity slanted into the earth at an angle and resurfaced only an arm’s length away. The edge of his uncle’s fishing net was propped on two sticks on either side of the burrow’s entrance. Careful not to knock over his trap, he set his tool down and pushed himself off the ground. His honey-yellow hair danced around his head as the breeze adjusted course. He turned his eyes to the sky, searching for signs of the fledgling gyrfalcon he’d followed into this valley. It had been a long day’s travel already, and he needed to return home. It wouldn’t be wise to return after his uncle had started his journey for the Althing, the yearly social gathering where Snælanders settled disputes and conducted business like marriages, trades and alliances. He needed to hurry up or go back empty-handed. Torin unbuckled his leather belt and dropped it into the grass. A spot of white barely noticeable to the naked eye could be seen amongst the ebony rock on a distant bluff. He kept his attention on that point as he slowly pulled off his cream-colored tunic, untied his leather shoes and dropped them beside his belt. His muscled arms tugged down on the waist of his pants, and soon he was as he’d been brought into the world—naked but for his silver arm ring and the pendant of Thor’s hammer that hung around his neck. He combed his hands through his hair and squeezed his eyes shut. Goosebumps rose on his skin. Every pore tingled with sensation as he felt himself change. The familiar tug on his arm hairs continued until they grew light, and he could no longer feel his fingers. His legs bent, lowering him down, and his rounded chest touched the ground. Eyes open, he snapped his beak, chasing away the strange sensation that lingered where his nose and mouth used to be. He glanced down at his white-feathered legs and at the arm ring and necklace that had fallen into the grass. Clicking noises rattled from his throat. Torin braced himself against a gust of wind, then scurried forward with his plan in mind. It had taken him years to adjust to such a different body, one so unlike his own, and it wasn’t very hard to stumble around on purpose. He pulled out one wing, letting the tips of his mottled gray feathers drag against the blades of grass. He knew this posture, coupled with his stumbling walk, would tempt any predator with an empty belly. That’s what he was counting on. His eyes remained on the porous rocky bluff and his target. Two years ago he’d nearly paid the ultimate price for not respecting the gyrfalcon’s ability to hunt. He wouldn’t make that mistake again. The activity of limping around the opening of the trap was repetitive, but no more than digging out the tunnel had been. His stomach was beginning to complain. It didn’t faze Torin, as he was used to it—putting in a hard day’s work and eating a late meal was normal. Plus, he needed a new eyas, a new fledgling falcon for training. Especially if he was going to sell all of his experienced hunting birds at the Althing. He never let himself grow weary from scurrying around. He continued holding his attention on the white speck on the distant bluff. When it finally took to the skies, Torin hurried to the mouth of the tunnel. His avian eyesight allowed him to see everywhere but his blind spot—behind him. He positioned himself and waited for the gyrfalcon to circle. Torin had put into motion a very dangerous hunt. Speed was essential. He didn’t want to injure the animal or make a wrong move and lose it. Neither did he wish to risk his own neck. The signs that the raptor was preparing to strike were clear. He was fortunate it wasn’t a cloudy day, because he could see the white form against the cobalt sky. Just as the hunter dove toward him, he darted into the tunnel. Something tugged at his tail feathers, and he felt his quills breaking free from his body. It didn’t slow him, but instead spurred him to go faster. He followed the channel until daylight touched his back. As soon as his body was clear, he called to his human shape. He didn’t wait for the transition to complete before he spun around, moving back toward the other opening and his assailant. His flesh would have tingled if he weren’t consumed with the thrill of the chase. A screech passed from his beak, then turned into a man’s cry. His feathered arm reached out for the propped-up net, tipping it onto the snow-white gyrfalcon. It was over within seconds. Torin groaned in the dirt before pushing himself onto his hands and knees and crawling forward to check on the raptor. It snapped at him between frantic flaps when he reached for it. It didn’t appear to be injured. In fact, it was quite spirited, but he knew it would calm down soon enough. He tossed a square of fabric over the bird, and within seconds, it settled. Torin picked up his pants from the ground and got dressed. Then he put his armband around his bicep and his necklace about his neck. After buckling his leather belt, he opened the satchel that was fastened to it and removed a small, dark leather hood. The animal had remained relatively still while he got dressed. Now, he carefully reached for the edge of the fabric that covered the falcon. He could tell from the direction of the lump which way it was sitting, so he began to lift the net and cloth away from its tail. When its back was exposed, he gently placed his free hand against it, holding it down. The head was uncovered, and as quick as Torin could move, he tried to slip the hood over the raptor’s eyes. He wasn’t fast enough to avoid his flesh getting marked by the youngster’s strong beak. “Ah!” Torin growled and tied the hood to the bird. Once he was done, he picked up the animal and tucked it under his arm, holding firmly onto its talons. He glanced at his hand. The bite wasn’t deep, but it was bleeding. This was a sign of good luck, finding an eyas before the trip to the Althing. Just what he needed. He walked through the grassy valley to the place he’d tied off his horse. It hadn’t noticed his absence since it had been feeding on fresh summer greens. With his free hand, he held onto the saddle and jumped onto the chestnut’s back, keeping the raptor safe against him. After settling comfortably, he nudged the animal forward. The sun had passed its daymark some time ago. It was nearing midday, he observed. If he were the type of man who liked company, the long trip back home might have bothered him, but he preferred being alone and away from his uncle’s longhouse. It was quiet when he went out in the valleys searching for gyrfalcons. His young cousin had begged to join him, but he worked alone out in the wilds. Hróaldr was learning the trade after witnessing the amount of silver and gold that lined Torin’s purse. But Torin had never exposed his special gift from the gods—the ability to turn into his fylgja, or animal familiar. It was his secret strength, which made his catching and training abilities unparalleled. His uncle, Fólki, conveniently wanted his youngest focused on battle training during his twelfth summer, since tensions between the chieftains of the southern territories had increased. That had provided the perfect day out alone for Torin. The ride across the volcanic, pockmarked hills was uneventful, except for the herds of sheep and cattle he encountered. Daylight streamed against his shoulders the entire way, giving no sign of breaking for the night measure. The sun rarely fell below the horizon for very long during summer. The forested area near his uncle’s farm came into view. He tried not to look upon it. It only reminded him of the grove that surrounded the place he was born. A place he hadn’t revisited since he’d left it nearly ten years ago with his young stepsister to live with his father’s kin. Torin approached a clear spring in the rocky fields outside the confines of the farm. He climbed from the back of his horse and led the animal toward the cold water for a drink. While the animal quenched itself, he wandered out to collect some flowering dandelions as he always did. He returned with them grasped in his hands and stood at the place they’d found her body. His sweet innocent sister. He dropped the yellow blooms into the water and watched them float a short distance before they sank to the bottom. He forced himself to stop here every time he passed by even though it put him in a sour mood. It was, after all, his fault she had died. She’d been his responsibility to look after. His father had told him so when he’d left them for the summer raids. The raids he never returned from. Torin had never felt the sting of a blade sinking into his flesh, but he imagined this was what it felt like: an axe to the heart. Something he carried wherever he went. The guilt that he’d killed his mother and sister, both. One from childbirth, the other because of his selfish curiosity. Instead of going to the spring with his six-year-old sister, he’d gone to watch the puffins nesting. He lifted his bladder of ale to his lips. It was enough to keep his mouth from drying, but it didn’t provide the numbing sensation he sought. When Torin arrived back at the farm, a hazy twilight had set on the landscape. He entered the gate, leading his horse behind him with the falcon tucked under his arm. He unbuckled and lifted off his riding gear from his mare. Then he went to the animal shed to retrieve an empty mew. Torin coaxed the bird onto the perch inside the cage, secured the latch and carried the young falcon with him to the longhouse. Beside the home was a wooden rack that held strips of flesh. The shark meat had been unearthed from the ground to dry so that its poison was leached out before it was consumed, but Torin preferred it best when it left him dizzy and drunken. He reached out to cut off a piece. Its aroma was strong and potent, curling in his nostrils. Without a care, he popped it in his mouth and chewed it well before swallowing, knowing its effects would set in soon to help him fall asleep. He turned back to the home. The half-light touched the stalks of grass that grew on its roof and outer walls. Grateful that the door was left unlocked, he ducked through the thick wood-lined entrance room and bolted the lock behind him. He moved into the great hall, careful not to wake anyone sleeping along the long built-in benches that ran the length of the space. Although the hearth’s fire at the center of the room had gone out, it was still quite smoky. Enough light shone through the hole in the roof for him to find his way safely across to the opposite end of the hall. In a smaller room reserved for valuable animals, he set the mew down beside the others that housed his trained raptors: a safe place away from the door where one would not be tempted to take such valuable possessions. He crept back into the great room and found a place beside his younger cousin on the fur-lined bench to lie and prop himself against the wall. Thoughts of his sister’s limp body filled his mind, along with memories of the farm that was lost to him. He would likely never have his own land to tend as his father had. Not while he had a place with his uncle. Even if he married, they would come to live here. A place that was haunted with painful memories. As soon as his head rested on the wooden wainscoting, his muscles began to relax and his mind grew foggy. The dizziness born from the shark’s poison touched his mind and made it swirl. He could no longer hold onto his pain or guilt. Everything grew foggy, and sleep came to him soon after. Torin cleared his throat and nodded at the boy, which brought on a throbbing headache. The women at the center of the room who were preparing breakfast glanced at them, and he gently shoved the youngster away from him so he could wipe the sleep from his eyes. It didn’t feel like he’d gotten much rest. He probably hadn’t. “That’s my boy!” A voice boomed from across the room at the doorway. “I thank you, Uncle,” Torin responded as he stood up and swayed, stumbling off the bench, joining Fólki on the dirt floor. Torin didn’t answer. He knew how disappointing he was to Fólki. Somewhere in his heart he cared, but his guilt overshadowed it and demanded payment. Torin had always known it was only a matter of time before his uncle pressured him into marriage. It seemed like every week he heard the threat. It appeared to be unavoidable. Hróaldr’s chin touched his chest in defeat. He gave Torin a pitiful look before brushing past his father to go outside. “Yes, Uncle,” Torin answered, not wanting to agitate him. Fólki wasn’t just family, but Torin’s gothi as well—one of the nine chieftains of the southern quarter. No matter how uninterested he was in settling down, it wasn’t worth his leader’s anger. He tried to shake off his dizziness before entering the animal room at the back of the house. It was empty of prized livestock now, but come winter it would be full. He lifted two cloth-covered mews from the floor, one containing a seasoned and trained gyrfalcon and the other a white-tailed eagle. Although he had enough silver saved up to pay the bride price of a good woman, he was sure to make a fine profit off the gyrfalcon as well, as they were the most prized birds of Snæland. The eagle’s worth wasn’t nearly as high, but they made better companions—if you liked getting harassed by your pet. All of the falconry equipment was stowed in his leather bag. From his wooden chest, he pulled out another silver arm ring, which he slid up against its match on his bicep. His purse, full of silver bits, was clasped to his belt. Frida, Ingvar’s wife, handed him a warm tasteless flatbread, which he ate quickly before it hardened from cooling. Tiny grains of stone crunched against his teeth, so he chewed carefully to avoid breaking a tooth. While he swallowed the last bite, he picked up his sword, shield, leather bag and mews. “Other way?” she questioned, laying her hand on his forearm. Torin rushed over to his uncle’s cart to safely stow the wooden mews containing his valuable birds to sell at the gathering. After locating his horse in the animal stalls, he lifted the saddle onto its back and fastened it. The bridle was put on, and soon all of his belongings were strapped in place. “Feed it with the glove.” Hróaldr finished his sentence. “Very well. Thank you for helping me. Before you can blink, you will be at the Althing.” He jumped onto his horse to join the others who were beginning to move away from the longhouse, toward the boundary wall and gate. Torin dropped his chin to his chest and glared at the horizon. He saw no benefit in wasting energy on his appearance. If he took two weeks between shaving the whiskers on his neck and face, it didn’t matter to him. And it was the poisonous shark meat that had helped him get to sleep the night before. It was the only thing that kept his pain in check.